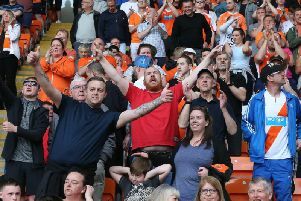 Blackpool boss Gary Bowyer was a happy man after watching his side record another pre-season victory on Tuesday night. Goals from Danny Philliskirk and Mark Cullen (2) gave the Seasiders a 3-0 win at Chorley ahead of Saturday’s final pre-season friendly at Macclesfield Town. Both men carried on from where they left off after scoring in Blackpool’s victory at Radcliffe Borough last weekend. “It was a fantastic strike from Danny,” Bowyer said come full-time at Victory Park. “He scored on saturday and you could see the confidence in him from scoring goals. Just as pleasing for Bowyer was the way in which his players continued to develop a more possession-based style of play ahead of the new League One season. While it remains an ongoing process, the manager was just as happy at the commitment and desire shown by his players, not least in helping to record another clean sheet. “I thought it was a very good workout again,” he said. “It was important that we got another 90 minutes into some of the players – or as close to. “Again, we’ve kept a clean sheet and scored some good goals. “I’m pleased with how we are trying to play and the way the players are applying themselves to it. “We’ve worked hard in pre-season on keeping possession more and, I think, credit to the players because they have really taken it on board. “Perhaps that final pass which just comes from practice and we could have had a few more but I thought we showed great desire as well in keeping the ball out of the net. While Saturday’s trip to the Moss Rose is Blackpool’s final pre-season game before the new season, there will be an opportunity for players to stake their claim today with another match behind closed doors. “They will get 90 minutes under their belt,” Bowyer said of the players set to be involved today.